Scientists on NASA's Juno mission have observed massive amounts of energy swirling over Jupiter's polar regions that contribute to the giant planet's powerful aurora - only not in ways the researchers expected. 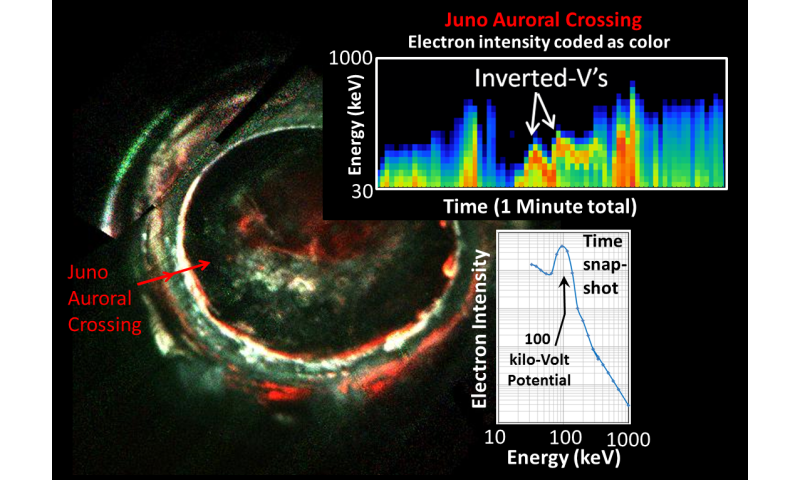 Examining data collected by the ultraviolet spectrograph and energetic-particle detector instruments aboard the Jupiter-orbiting Juno spacecraft, a team led by Barry Mauk of the Johns Hopkins University Applied Physics Laboratory, Laurel, Maryland, observed signatures of powerful electric potentials, aligned with Jupiter's magnetic field, that accelerate electrons toward the Jovian atmosphere at energies up to 400,000 electron volts. This is 10 to 30 times higher than the largest auroral potentials observed at Earth, where only several thousands of volts are typically needed to generate the most intense aurora—known as discrete aurora—the dazzling, twisting, snake-like northern and southern lights seen in places like Alaska and Canada, northern Europe, and many other northern and southern polar regions. Jupiter has the most powerful aurora in the solar system, so the team was not surprised that electric potentials play a role in their generation. What's puzzling the researchers, Mauk said, is that despite the magnitudes of these potentials at Jupiter, they are observed only sometimes and are not the source of the most intense auroras, as they are at Earth. 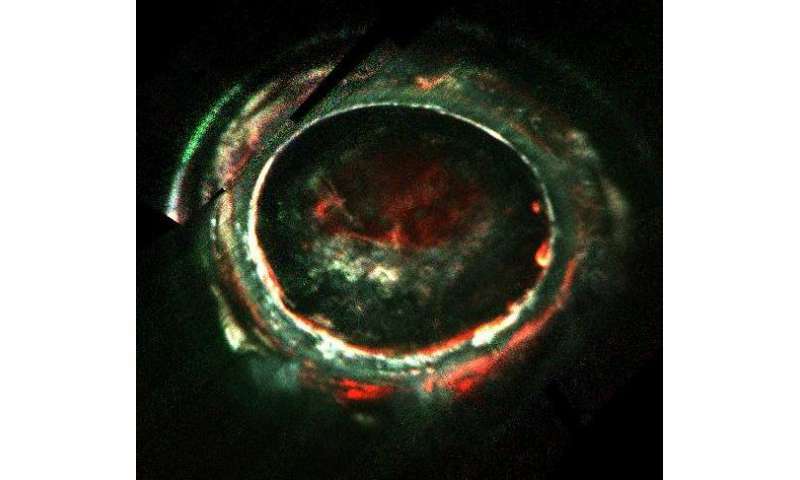 "At Jupiter, the brightest auroras are caused by some kind of turbulent acceleration process that we do not understand very well," said Mauk, who leads the investigation team for the APL-built Jupiter Energetic Particle Detector Instrument (JEDI). "There are hints in our latest data indicating that as the power density of the auroral generation becomes stronger and stronger, the process becomes unstable and a new acceleration process takes over. But we'll have to keep looking at the data." Scientists consider Jupiter to be a physics lab of sorts for worlds beyond our solar system, saying the ability of Jupiter to accelerate charged particles to immense energies has implications for how more distant astrophysical systems accelerate particles. But what they learn about the forces driving Jupiter's aurora and shaping its space weather environment also has practical implications in our own planetary backyard. "The highest energies that we are observing within Jupiter's auroral regions are formidable. These energetic particles that create the aurora are part of the story in understanding Jupiter's radiation belts, which pose such a challenge to Juno and to upcoming spacecraft missions to Jupiter under development," said Mauk. "Engineering around the debilitating effects of radiation has always been a challenge to spacecraft engineers for missions at Earth and elsewhere in the solar system. What we learn here, and from spacecraft like NASA's Van Allen Probes and Magnetospheric Multiscale mission (MMS) that are exploring Earth's magnetosphere, will teach us a lot about space weather and protecting spacecraft and astronauts in harsh space environments. Comparing the processes at Jupiter and Earth is incredibly valuable in testing our ideas of how planetary physics works." "At Jupiter, the brightest auroras are caused by some kind of turbulent acceleration process that we do not understand very well,"
At least they are honest about their ignorance of double layers, Birkeland Currents, electric fields, and other ubiquitous phenomena of plasma physics. observed signatures of powerful electric potentials, aligned with Jupiter's magnetic field, that accelerate electrons toward the Jovian atmosphere at energies up to 400,000 electron volts. There are clues to be had here, it should be blatantly obvious there are powerful electric fields involved. WG, the horse leads the cart, not the other way around. I your case, the brush spreads the paint, it is not the paint that moves the brush. Thus, it seems that there is possibly some irony here in that the admitted confusion of the astrophysicists on why these electrons appear unexpectedly accelerated may fundamentally relate to their refusal to consider that these same sort of cosmic E-fields can also act as the source for the very high energy cosmic rays which they also label a mystery. More correctly, the supposed driver laid out by the Cult of Bolts has been found to be physically untenable and without merit, thus leading to the increasingly tedious screeching of the Acolytes of the Cult. Just as the EM fields decides where/how the electrons go, not gravity. And just what decides where the EM fields are? ...what decides where the EM fields are? and first fundamental particles (according to SM) were 'charged particle' Quarks as part of a high-energy Quark-Gluon PLASMA. And... what characteristic makes it "Charged"? alongside charged Electrons, together forming a plasma of its own type/dynamics spread 'almost uniformly' across space with little density gradients between neighboring regions of space. You've described Hydrogen. With insufficient "charge" (density) to aggregate. Only unlike charges attract. And... Originally all the same, ergo, repelling. Remember - like charges repel... Something else had to initiate aggregation. And.... where did those come from....? I don't entirely agree with your "timeline". The E-M field itself is fundamentally ubiquitously/uniformly distributed; even when Quantum Chaos 'fluctuations' perturb this field, it remains essentially 'isometric/isotropic' everywhere UNTIL a LOCAL CHARGED perturbation produces a PERSISTENT SOLITONIC feature which we call 'particle' (be it fundamental Quark or more evolved Protons/Electrons. what characteristic makes it "Charged"? The Standard Model does not address/explain cause/source of fundamental 'charge' property. Again, the Standard Model doesn't say. No, I described a PLASMA consisting of + and - charged particles. Ionized Hydrogen is a +Proton particle; Electron is -charge. Something else had to initiate aggregation. You "theory"..
What "my theory"? I spoke only according to current Standard Model/Big Bang 'understandings' and 'concepts'. The Standard Model says they arise when "universe expanded and cooled" to allow Combination of +Hydrogen nuclei (+proton particles) and -Electron particles. that GRAVITY effectiveness became a 'player' in FURTHER aggregation concentration. With more mass-energy concentration/accumulation came more CUMULATIVE gravity STRENGTH, and the rest is, as they say, 'history' as observed all around us. The 'timeline' and 'volumetric' and 'scales/ratios' are as indicated/claimed by The Standard Model. So you disagree with that too? Great. Maybe you should construct your own ToE; or, if you already have, since you disagree with Standard Model, maybe you could post it for my benefit. The 'timeline' and 'volumetric' and 'scales/ratios' are as indicated/claimed by The Standard Model. So you disagree with that too?Maybe you should construct your own ToE; or, if you already have, since you disagree with Standard Model, maybe you could post it for my benefit. ... that GRAVITY effectiveness became a 'player' in FURTHER aggregation concentration. With more mass-energy concentration/accumulation came more CUMULATIVE gravity STRENGTH, and the rest is, as they say, 'history' as observed all around us. Are you using "spin momentum" to mean "angular momentum"? Or do you make some effective, physically meaningful, distinction between these two in your own 'ToE', Whyde? Are you using "spin momentum" to mean "angular momentum"? Or do you make some effective, physically meaningful, distinction between these two in your own 'ToE', Whyde? Don't believe in "ToE"s. They're like opinions, and can change at the drop of a hat. I rather prefer - "Best guess given the data available..."
From @RealityCheck: Are you using "spin momentum" to mean "angular momentum"? From @RealityCheck: Or do you make some effective, physically meaningful, distinction between these two in your own 'ToE', Whyde? From @Whyde: Don't believe in "ToE"s. They're like opinions, and can change at the drop of a hat. I rather prefer - "Best guess given the data available..."
Thanks. Can you please explain what 'physical energy-space system' and/or 'abstract analytical frame of reference' such fields' spin is relative to? But rest assured I am way ahead of you, so you won't be divulging anything which my now-completed ToE theorizing process hasn't already considered/accepted/rejected according to the objective reality-referential observations-and-logics-train involved in that process. I don't necessartily agree, but -Does that mean you're gonna send me a copy now? theorizing process hasn't already considered/accepted/rejected according to the objective reality-referential observations-and-logics-train involved in that process. And, that said - vortexes (spin). Differences of potential giving rise to physical interactions. Not at all; just observing our respective offerings vis-a-vis comprehending/explaining the universal physical reality; ie: recent mainstream discoveries/reviews in cosmo/astro/quantum physics are increasingly confirming me correct all along on many fronts/issues; can you claim likewise? Does that mean you're gonna send me a copy now? As soon as I've finalized my reality-based-axiom 'Maths' to 'model' it, then anyone may see a 'copy' of my reality-based-postulate 'ToE' on line. When he progresses to the stage that his 'observation' also encompasses the TRACKS on which they run, then he'll be 'on track' to comprehending the 'wider phenomena set'. - vortexes (spin). Differences of potential giving rise to physical interactions. Nothing - and ALMOST nothing.